How many ways can you shoot a free throw? If you're LeBron James, it's 18. The results? The worst free throw shooting season of his career. 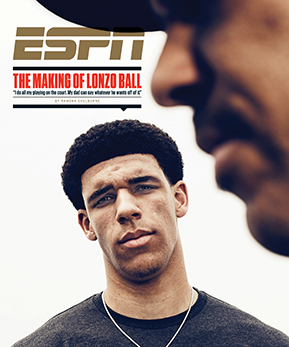 This story appears in ESPN The Magazine's May 29 Issue. Subscribe today! LeBron James shouldn't be shooting this free throw. It's Dec. 31 in Charlotte, with the Cavs up 114-104, and James is walking toward the charity stripe to shoot the technical. Based on pure math, this is a bad call. The four-time MVP is in the middle of the worst free throw shooting season of his career, converting just 67.9 percent. There are better options available to the Cavs -- like, for example, four-time All-Star Kevin Love, a career 82 percent free throw shooter. But this is alpha dog territory, and James has flexed his superstar status in moments like this before. Consider the 2010-11 Heat, which many consider the most alpha dog team ever. That season James, a career 74 percent free throw shooter at the time, shot 15 T's, while Dwyane Wade (77 percent) took one and Chris Bosh (80 percent) took zero. James made just 10 of the 15. Hornets fans should be delighted to see James at the line. When he shoots technical free throws, his accuracy gets markedly worse. In fact, among the 104 shooters since 1996 with at least 100 technical attempts to their name, James ranks as the worst, converting just 67 percent of his 248 tries, per NylonCalculus.com tracking. Even still, Love does what so many of James' teammates have done before: He steps aside and lets James take a crack at it. The referee passes LeBron the ball, and he begins his elaborate routine. He places the ball on his left hip and blows into his right fist as if to reignite a dimming ember. Then he lines up his toes on the line, dribbles three times, spins the ball in his left hand, steps backward with his left foot, rocks back, rocks forward, plants his left foot back on the line. He bends his knees. He looks up at the rim. He shoots. The shot falls short, bouncing off the front rim with a thud, the ball plopping right in front of James. He slaps it away while the Charlotte crowd collectively cheers and laughs at him. Few things electrify a crowd like an opposing star's missed technical free throw. James seems oddly rattled at the line this night. Earlier, in the first quarter, he had actually tripped in the middle of his free throw routine during that same unorthodox step-back, planting his foot too early and knocking himself off balance. Which helps to explain why James, in this moment, is visibly frustrated. This is his seventh technical free throw of the season, almost halfway to his career average of 18 per season -- and this one apparently cuts deep. No one knows it at the time, but with 50 games remaining, it will mark the last technical free throw that James will take in the 2016-17 season. James, like never before, has given up. 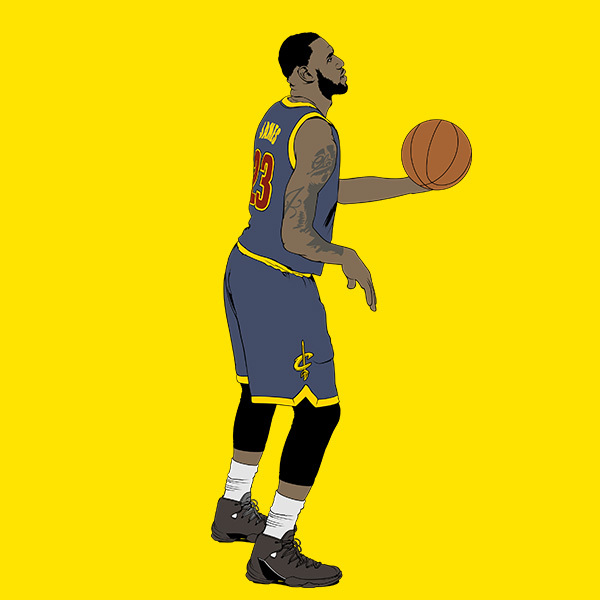 TO THE CASUAL fan, it might appear that LeBron does have something resembling a free throw ritual. A trio of dribbles ... spin the ball in his left hand ... shoot. Simple, right? 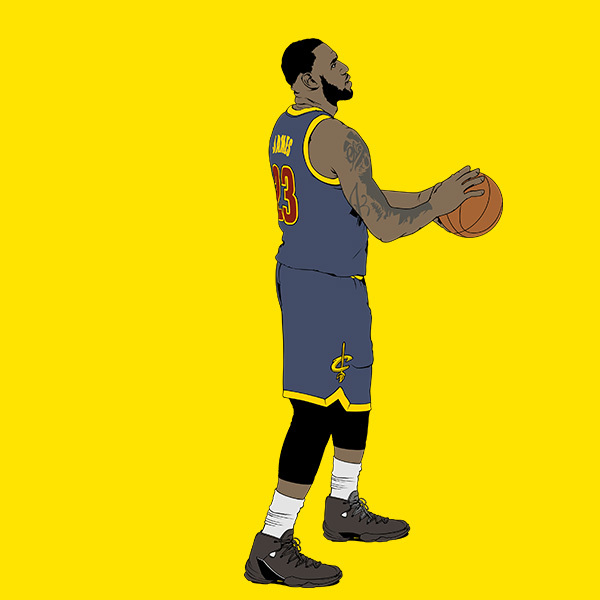 But in truth, almost nothing about James' free throw routine is routine at all. 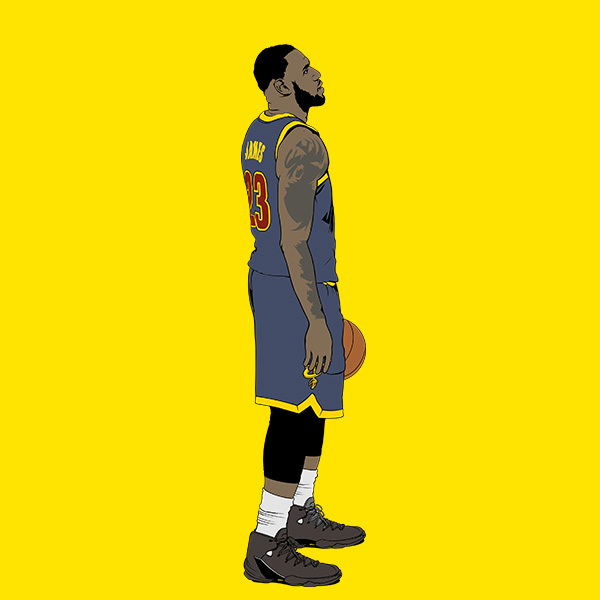 James has been notorious for changing his free throw routine over his career. In a rut, he once tried dipping his knees to the ground à la Jerry Stackhouse. During the 2006-07 season, James tried kissing each wrist before shooting, a tribute to his mother and now-wife. But this season, the tinkering has turned extreme -- James remixing the same sequence over and over, like a musician searching for the right version of a broken melody. At times, he's changed his routine multiple times in the same game. If he misses badly enough, he'll alter it between free throws. When it comes to free throw shooters, Pistons coach Stan Van Gundy has seen it all. Since joining the Heat as an assistant in 1996, he's coached some of the best at the free throw line, like J.J. Redick and Ryan Anderson, and some of the more, um, infamous ones, like Dwight Howard and Andre Drummond. Van Gundy says it's extremely rare for NBA players to change their routine. You could watch 10 players all year long, he notes, and they won't change a thing. For the typical player, free throw alterations almost never happen. "Once or twice a career, maybe," Van Gundy says. "Bad shooters, obviously more." But LeBron is not an especially bad shooter. His career average is 74 percent in a league that annually hovers around 75. In his first 13 seasons, his percentage never deviated from a low of 70 percent to a high of 78 percent. In 1993, a white-haired podiatrist from Long Beach, California, named Tom Amberry etched his name in the Guinness World Records by making 2,750 free throws in a row. In March, Amberry died at age 94, leaving behind a 144-page manual, published in 1996, on mastering free throws. It includes seven steps to successful free throw shooting, stressing the importance of keeping things simple and routine. In a 1994 Sports Illustrated profile, Amberry offered this advice: "You have to perfect all parts of your technique, then it's just focus and concentration. A free throw takes six seconds, and you can't think of anything else during those six seconds -- you have to put all other thoughts out of your mind. Each shot is a separate shot, and it's the same ritual every time." 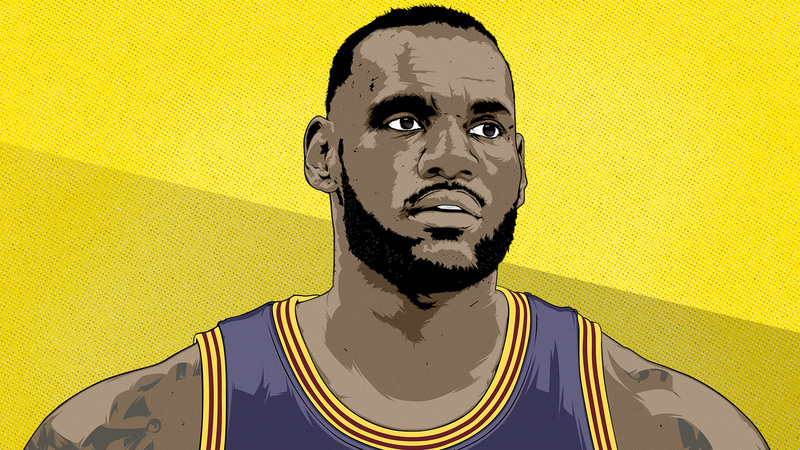 So what the heck has been going on with LeBron this season? And what price could the Cavaliers pay for it? 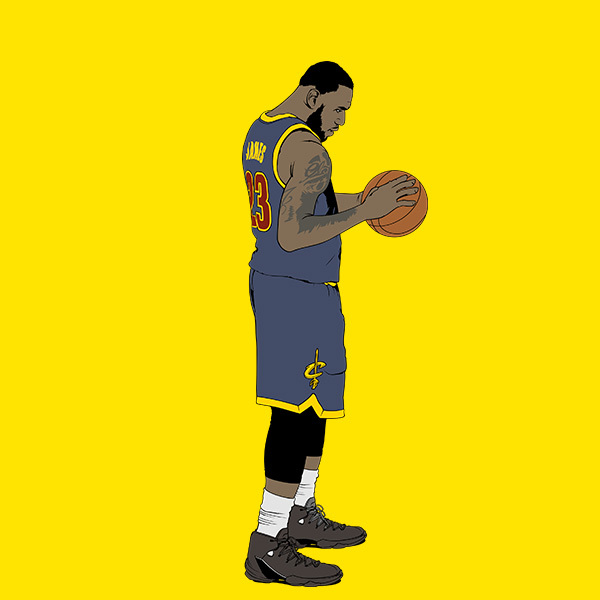 For his first free throw of November, James tinkered again, returning to the hand warmer. The move resulted in an air ball against the visiting Rockets. On Houston's broadcast, former Rockets sharpshooter Matt Bullard was rendered nearly speechless. "I think ... I don't even know what to say. LeBron with an air ball at the foul line? Are you kidding me?" Then, in a bizarre yet somehow predictable turn of events, James overhauled his footwork the following game. Playing against Boston on Nov. 3, he unveiled a step-back routine, mimicking an in-game jumper. Instead of both feet toeing the line, he began by setting his left foot several inches behind the line. While spinning the ball in his left hand, he simultaneously stepped with his left foot to about 12 inches behind him, then stepped forward back to the line. He shot a perfect 5-for-5 doing it this way. So he kept it, right? Nope. The first free throw in the next game followed a different pattern. 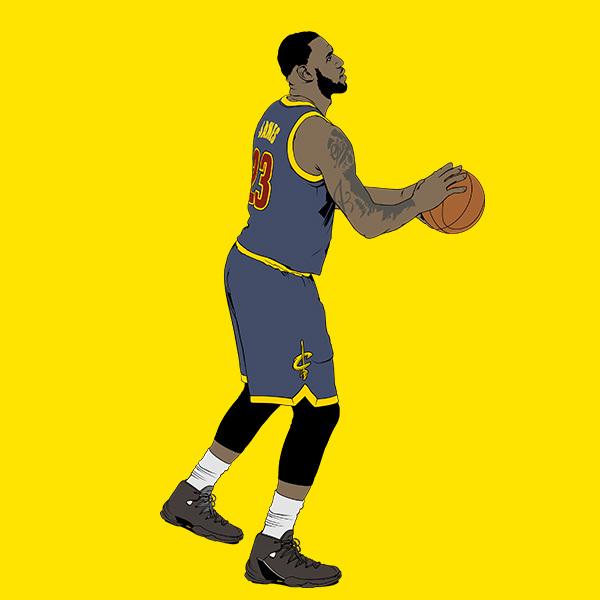 While stepping back with his left foot on a technical free throw, James took his right hand and swiped it straight down his chest as his left hand spun the ball. The shot barely grazed the front of the rim. The very next free throw he abandoned the chest swipe. It went like this for the rest of the season. He tinkered with at least four different hand gestures with his shooting hand: a hand-warmer gesture, a downward swipe of his chest, a backside swipe. Sometimes he'd do nothing. As for his feet? He used at least seven different foot patterns: the traditional two feet on the line; staggering his feet; a step-back; standing a foot behind the line (as he debuted on Christmas Day in front of 10 million viewers); shuffling his feet like someone waiting to use the restroom; lifting the toes of his front foot during the step-back like a rocking chair; and a toe tap that might have also been a trip. Catching the ball? Yet another adventure. Sometimes he received it, threw it on his left hip and took a huge breath while staring at the rim. Other times he sifted the ball in his hands as if dusting it off, or stood behind the line and began his dribbles while walking to the stripe. For a while, he got into the habit of shrugging his shoulders while he bent his knees, à la Kevin Durant. Sometimes it was a slow, deep crouch. Other times he didn't bend his knees at all. Occasionally he rhythmically gyrated like a man on a bouncy ball, or simply bent and straightened out. All in all, James employed 18 distinct free throw variations with countless combinations throughout the season. In November, James altered his routine at least 21 different times, cycling through various adjustments on the fly. During his worst month, when he converted just 62 percent in March, he changed his routine in every single game. The only constant was change. Said one former James teammate watching closely: "It's the yips." YEP THAT'S RIGHT. We said it. The yips -- the malady that dare not speak its name. But as long as oversized NBA players have been around, the free throw yips have afflicted them. Wilt Chamberlain, Bill Russell, Shaquille O'Neal, Dwight Howard, Andre Drummond. All bigs. All struggled. And while many fans don't think of James as a big, at 6-foot-8 and 250 pounds, he's no shrimp. He's the same build as yips-afflicted center Ben Wallace -- a career 41 percent free throw shooter. For whatever reason, the free throw line can be the loneliest place on earth for large human beings. Heart rates go up. Stress levels rise. Minds short-circuit nervous systems. These qualities had never defined James, but it appears he might be prey to the same collection of symptoms they suffer. Much studied by everyone from NASA to academics obsessed with putting, yips are a known psychological condition called focal dystonia. When in effect, completing a task -- free throw shooting in James' case -- triggers a short circuit in the body's neurological network. The root of the problem isn't physical, even if James cycles through dozens of physical patterns. The breakdown happens upstairs. For his part, coach Tyronn Lue, who played for Van Gundy in Orlando's 2009 Finals run, doesn't think more tinkering is the solution for James. "I mean, I think he's a decent free throw shooter," Lue told ESPN's Dave McMenamin, referring to LeBron, during the Cavs' first-round series against the Pacers. "Don't change. You're the best player in the world, do what you do, have confidence doing it -- that's it." Earlier this year, James summoned Kyle Korver to help tweak his routine even more. But it wasn't the first time James had taken up tutelage from a teammate. In the 2013 Eastern Conference semis, he began to mimic teammate Ray Allen's routine. Instead of bending his legs almost to a 90-degree angle, James dipped only slightly, just like Allen always did. "The free throws right now is his nemesis," Allen said at the time. "I've been consistently in the top five in the NBA in free throws, so what better person to learn it from?" At the time, Allen and James discussed the elusive 80 percent threshold, a mark James hadn't cleared in his storied career. "I want to -- I need to shoot in the 80s," James said then. "That's my next goal." Two games later, after shooting 4-for-8 in Game 2, James abandoned the Allen project altogether. The Heat worked with James to keep his routine consistent, but nothing seemed to work. It got so vexing that at one point the Heat coaching staff would show video of James' routine to the entire team and jokingly ask if this particular one would stick. As we now know, none of them would. Consider current results. Prior to a surprisingly strong four-game stretch in the Cavs' recent sweep of the Raptors, James managed a mere 22-of-38 (57.9 percent) from the line in four games vs. Indiana in the playoffs. Prior to that, he'd shot at least 35 free throws over a four-game stretch 88 times in his playoff career. Never during one had he shot that poorly -- so poorly that one began to wonder if the Pacers might opt for the nuclear option. And then it came. Late in Game 3 in Indiana, the Pacers repeatedly fouled James, lighting social media ablaze with Hack-a-LeBron speculation. Two days later, reporters asked James if he was worried about his free throws. It's not a mental thing? IT'S DEC. 29, and the Cavs are in a dogfight with the Celtics. Up by one point with 21.3 seconds left, James takes Marcus Smart off the dribble, but Smart bumps him near the foul line. And that's where James heads next. 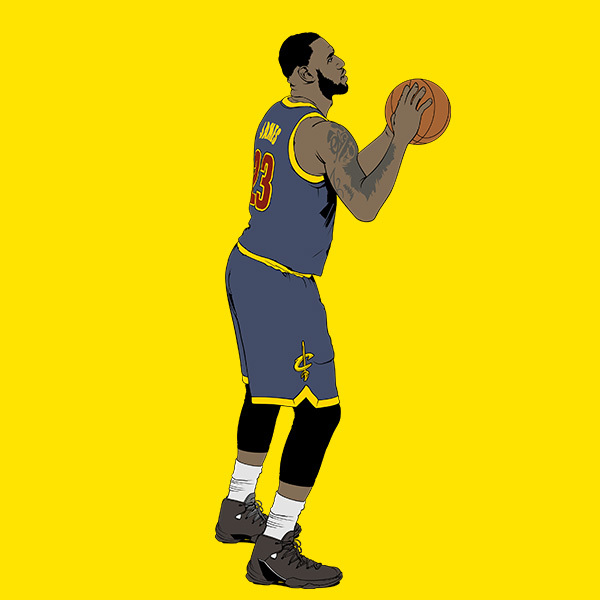 For this free throw, he dribbles three times, spins the ball into his left palm, simultaneously takes a step back with his left foot 18 inches behind his right foot while raising his right fist and blowing into it, and then steps back into the shot, complete with a shoulder shrug. It's enough movement to make a juggler sweat. It's almost as if he's trying to distract himself from thinking. James pauses as he bends his knees. He rises and flicks his right wrist. He misses the shot, back iron. He blows into his right fist, looking at the clock. He blows into his left fist, then his right again. He wipes his shooting hand on his chest. He blows into his hand a third time. Then he raises his fist again for a fourth blow. The ref passes him the ball. He repeats the step-back sequence and swishes it. With James splitting the free throws, the Cavs would go on to win by six. Crisis averted. Why is this worth mentioning? Those were the only free throws James would take all regular season in the final minute of a one-possession game. Now read that sentence again and consider what it means. Just two do-or-die free throws during an entire regular season is the outlier of all outliers. Last season James took 15 such shots. In 2013-14, he took 21, the second-highest total in the NBA. In 2007-08, he took 32. In fact, he's averaged 18 such shots per season since 2005-06 and never fewer than 11 -- until this season's total of two, which placed him tied for 117th in the NBA with Tim Quarterman, Luc Mbah a Moute and Marcus Georges-Hunt. How does one explain this? The cause seems almost inescapable: James is running away from the do-or-die free throw. And James' shot selection in these situations does nothing to exonerate him. This season he took 13 field goal attempts in one-possession games in the final minute, firing up eight 3-pointers and barely getting into the paint. His average shot distance in these super-clutch situations is 19.4 feet away from the basket, per NBA.com. In other words, he's settling for the long jumper -- a shot far less likely to draw a foul. James' average shot distance last season? About half the distance, 10.8 feet. In Game 1 against the Pacers, a golden opportunity presented itself. With the ball, up by one with 25 seconds left in the game, James got the mismatch he wanted. 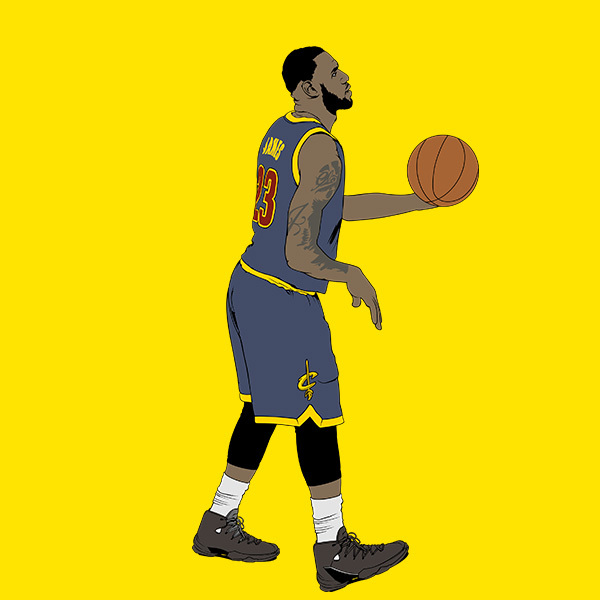 He towered over the 6-2 Jeff Teague, who had switched onto him after a screen by Kyrie Irving. James could have easily backed him down and overpowered him en route to the rim. Instead, he pulled up for a contested 3-pointer with seven seconds on the shot clock. And missed. Perhaps as important, he avoided the trip to the free throw line -- yet again. WITH INDIANA'S SEASON on life support, three Pacers players grab onto James' body to send him to the line. Down three points and facing a sweep in the opening round of the playoffs, Paul George has just missed a last-ditch 3-pointer and James has come up with the rebound. One second remains on the clock. 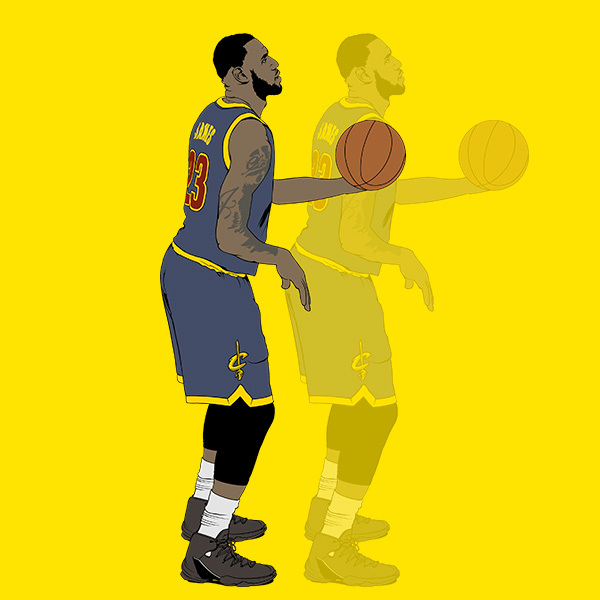 All James needs to do is make one measly free throw out of two and the Cavs can go on and sweep the series. It is here that James finds himself at the free throw line in the final minute of a one-possession game -- the first time he's been in this spot in four months. He catches the ball from the referee. He puts the ball on his left hip and looks up at the rim. One deep breath. Two deep breaths. He looks down. His feet are staggered. He begins. One dribble. Another. Another. Spin with the left. No hand warmer with the right. No chest swipe. No step-back. No shuffle of the feet. A light shoulder shrug. No deep crouch. Actually, no crouch at all. Finally, he rises and releases the ball toward the rim. It rattles in. And as the Pacers' door shuts, James keeps his follow-through up high, pivots toward his bench and pumps his fist. 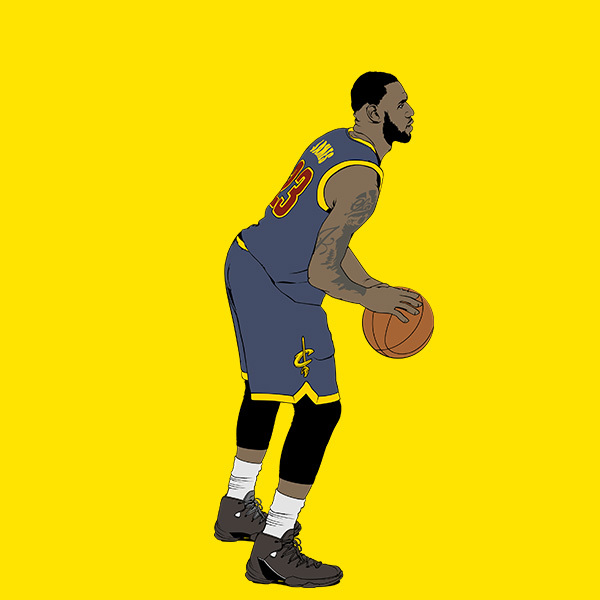 On the second free throw, James repeats the routine exactly as the first, every motion precisely the same. He lets it fly. James walks away, raising a pumped fist in the air, just as he celebrated the first one. He missed the shot, but the alpha dog can exhale.